Public networks (both wired and wireless) are great. After all, what would life be without connecting while at airports, hotels and coffee shops? However, the danger to your personal data exists even if you connect to a fee based open network. Your passwords, credit card numbers, and any data you send can be seen and associated with you personally. Standard antivirus software wont protect you as this threat is on the network, not your laptop or iPhone. 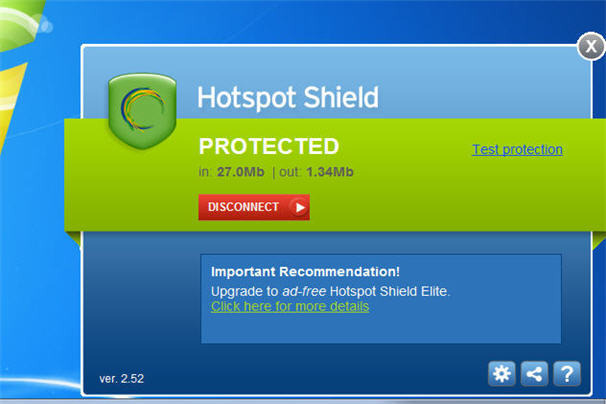 That's why AnchorFree is pleased to offer Hotspot Shield. Our application keeps your Internet connection secure and anonymous on public networks. Hotspot Shield creates a virtual private network (VPN) between your laptop or iPhone and our Internet gateway. This impenetrable tunnel prevents snoopers and hackers from viewing your email, instant messages, credit card information or anything else you send over the network. Hotspot Shield security application is free to download, employs the latest VPN technology, and is easy to install and use. • Secure your web session with HTTPS encryption. • Hide your IP address for your privacy online. • Access all content privately without censorship; bypass firewalls. • Protect yourself from snoopers at Wi-Fi hotspots, hotels, airports, corporate offices and ISP hubs. • Works on wireless and wired connections alike. • Secure your data & personal information online. With more and more activities moving online today, the necessity for reliable, dedicated security is higher than ever. This is especially true for those who are looking at doing any shopping or other activities online where personal information security is paramount to ensuring that your credit card and other information is not leaked to others who are always on the prowl to steal personal information for their own gain. Working to provide greater peace of mind for all users both at home and on the go, Hotspot Shield works to provide all users around the world with greater security in all of their online activities by protecting their information and privacy at all times. Designed to encrypt all transfers and transactions coming from your computer through secured HTTPS algorithms, Hotspot Shield works to secure all online sessions and data transfers you initiate. Additionally, its security focus allows for it to hide your IP address to prevent location identification and other information, allow access to all content privately without censorship to bypass firewalls and protect your computer against potential invaders that may be present on public networks such as those found at Wi-Fi spots, hotels, corporate office, airports or any other public access point for internet usage. In short, the only way that your computer and identity can be identified while using Hotspot Shield is if you personally log into a website to conduct some sort of transaction or information transfer, at which point the website itself will know your identity from your personal access records. All other information relating to who you are and what you are doing, however, will be encrypted to any potential third party snooping to try and gain valuable information on your activities. Better still is the new Hotspot Shield package comes with an additional level of protection: anti-malware and virus protection provided by a combined effort of Hotspot Shield and Webroot. This means that not only will your online browsing experience be more secure and reliable than ever but at the same time you will be able to actively better protect your machine from unwanted programs and intrusions from occurring even if your antivirus software and other firewalls are out of date - meaning just one more step in helping ensure that your private information is safe and secure at all times and letting you rest easy at night knowing your computer is protected 24/7/365. What more could you ask for – honestly?